Uber has launched a new minibus service in the Egyptian capital Cairo, the first city globally to be rolling out the product, the ride-hailing giant's CEO said on Tuesday, as the company looks to reach the low-income user segment. Uber Bus will "now be the most affordable way to use Uber technology to get around the city," CEO Dara Khosrowshahi told a news conference in Cairo. The new launch is part of the company’s major push to offer low-cost transportation formats as it aims to attract new rider segments, including those who might not be able to afford a traditional Uber car ride. “There are millions of people in Egypt and around the world who still face real barriers to using Uber,” Khosrowshahi said, adding that the new service will make the company’s products more accessible. In the infamously traffic-clogged city, Uber hopes the new bus-booking service will help reduce congestion, pollution and free up space on the road used for parking by replacing personal automobiles. Also on Tuesday, the company said it would launch a simpler, smaller-size version of its app in the Middle East early next year. Uber Lite, which is now being piloted in Pakistan, is designed to work on slower networks and older mobile phones, and it consumes less internet bandwidth. Egypt is Uber's biggest market in the Middle East and among the company's top 10 global markets in terms of the number of trips people take using the app. Uber estimates that more than five million Egyptians use its app to commute every day across half of the cities in Egypt, and the San Francisco-based company aims to further scale up its business in the fast-growing market, where it employs over 90,000 active drivers. "Egypt and the Middle East region are hugely important to Uber and we will continue to invest heavily in this part of the world," Khosrowshahi said. The company aims to grow the number of global users regularly using the app from 100 million to 1 billion, he added. It is investing over $100 million into a customer support center in Cairo that serves the Middle East and North Africa. 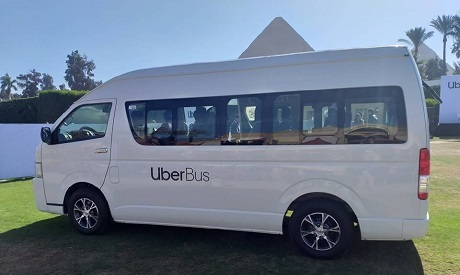 The new bus service is expected to cost customers 80 percent less than Uber's standard car service, Uber's general manager for the Middle East and North Africa region Abdellatif Waked told Ahram Online. Uber has been testing the minibus service in Cairo since September. Passengers can request a bus ride through the standard Uber app, which finds other riders traveling in the same route and directs them to a pick-up spot. The app will show riders walking directions to both pick-up and drop-off points, making the service a "combination of waiting and walking." “Cairo is a huge city for us, millions of people move around every day and traffic is a nightmare for people getting around, so a service like Uber Bus where you can get more people in less cars will help with congestion and at the same time provide a price point that is much lower," Waked said. The service currently runs along four lines in the districts of Nasr City, Mohandessin and Heliopolis. Uber aims to roll out the service in other Egyptian cities in the coming months and plans to expand it to other countries in Africa and the Middle East as part of its goal to become a one-stop-shop for all transportation and delivery needs. Egypt's government is working to attract greater private sector investments in the transport sector as part of efforts to bolster competitiveness and offer more efficient services and better prices for Egyptians, Egyptian Investment Minister Sahar Nasr, who attended Tuesday's launching ceremony, said. The government also welcomes companies like Uber as they help increase tax revenues and employ many Egyptians from the country's informal sector, she added. Tuesday's announcement came one day after Uber's Middle East rival Careem launched a bus-booking service in Egypt, which it said would soon expand into Saudi Arabia and Pakistan. Uber already operates other shared-ride options in the country such as its carpooling service UberPool and motorbike ride service Uber Scooter.